Maybe you'll never visit my blog again? Because I organized my refrigerator. And why not organize it? Isn't a refrigerator but a cold cabinet? cause she offered to, cause we don't use chemicals in our house to clean things anymore. and I opened up my fridge. I took everything out of the fridge. Then, I stood back and took a gander at the nekked inside of our fridge. I sprayed them all with the Basic H-2. but all I did was rinse everything off in hot water and it was CLEAN!! I dried all the pieces and put them back into place. 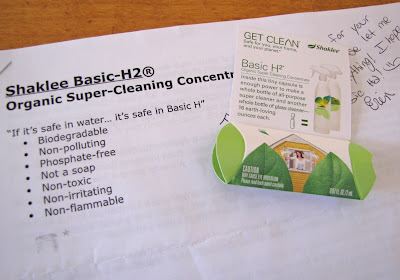 I really like this Basic-H2 stuff! Earlier this week, I found these lovelies at Wal-Mart. The 3 large handled baskets were $2.50 each. The 3 small handled baskets were $2.00 each. And the 4 packs of storage trays were $1.17 each. that has been lost in the abyss that is called the back of my refrigerator. Below: bread-making supplies, dairy items, Chick-Fil-A catsup? and sushi ginger slices, PB & J. The drawer got categorized, too. 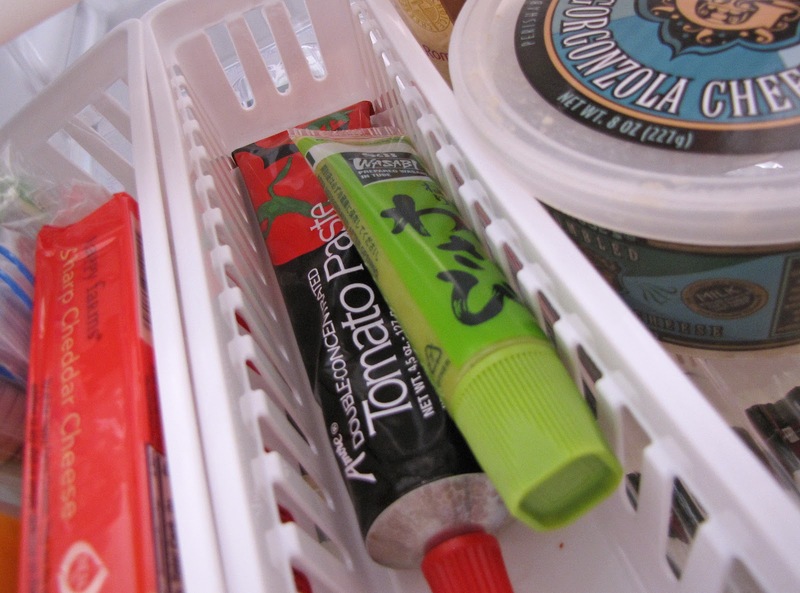 Cheese, tomato paste and wasabi (I make sushi! ), and more cheese. I end up throwing a lot of food away because it gets stuck at the back. And I forget about it. so I am not tempted to go to the pantry and get chocolate. get what I need, and slide it back on the shelf. We do not eat a lot of meat, so we usually do have this much produce on hand. About twice a week we eat fish or chicken with our veggies. What's also nice about the bins is that they keep the refrigerator cleaner. If something gets leaky, it stays in the bin, and I rinse the bin out. I'll have you know: I stopped short of labeling the bins. See, I'm not so crazy! P.S. You just saw INSIDE my fridge, click HERE to see what's ON my fridge door. Well, it's got to be done, Leslie! Unfortunately, this is part of the unglamorous side of keeping house, but I'm glad you shared it. And, yes, I do have things that get pushed to the back and when I do find them I always think "how long has this been here"! : ) In fact, I should probably add this to my To Do list this weekend. Leslie, your refrigerator is one of cleanest and most orgainized I have seen. 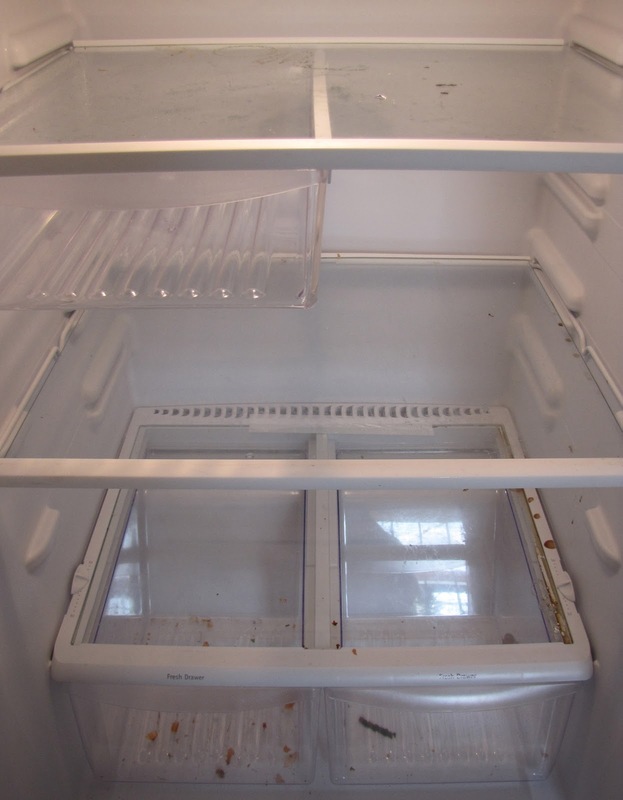 I dread cleaning my refrigerator. I procrastinate until there is leftover galore! Oh my word. I love this. I never thought to use baskets to organize my fridge. When I do a big shopping trip I clean out the fridge and put things away organized but it doesn't take long for things to be out of order. The baskets with the handles are my favorite. Also, I noticed potatoes and onions in your fridge. I always thought those should be left out. Hmm. Yes, they should! the sugars in the potatoes sweeten when in the fridge and onions dehydrate. Also, store the potatoes and onions separately! I store my potatoes and onions in the fridge and have never had a problem. A thing of beauty, really. Could you come do mine now?? Why are you not using that Corona for some beer bread, or to add flavor to spaghetti sauce, or you could pour it on your compost pile - the yeast helps the compost to rot quicker. Oh, and I make sushi too....I just haven't done it in a while. That may need to be on next weeks menu! What a coincidence, I cleaned out my frig yesterday. It was out of necessity. I opened the door yesterday morning, and lo and behold I thought, well I better not say what I thought... :-O It was the oysters Mr. C bought last weekend while he was Krogering, he thought the girls might like to taste them. Buuuut, they weren't interested! They kind of got pushed to the back and forgotten. Until I smelled them yesterday, and about died. I love how you used the bins! It's makes everything easier to locate. Never, ever thought about extra bins for the frig. I'll stop now, this comment is turning into a blogpost. So sorry. Again, you've impressed me! My fridge needs this treatment. I love the bin idea but I'm wondering if anyone in my family but me would participate! :) Maybe I should start with one or two bins. Ease them into the concept! Thanks for sharing your little ocd. We all have a bit of it I think. I LOVE IT!!!! Yes, I must be an OCD kindred spirit, except now my fridge is looking pretty sad compared to yours!!!! Pretty sad, indeed..and grungy. I love the idea of the bins...I love organizational tools (even when I don't quite use them correctly!!!) You did good, girl! BTW, congrats on your weight loss and here's to the rest melting away!!! Stopping in from Amanda's Weekend Bloggy Reading Party to say hi! Oh dear, what a lovely way to organize the beasts in the fridge. Just got a bottle of water and quickly shut the door so nothing would fall out. May have to attack it too. Leslie, I think your fridge could now qualify for a feature in a magazine...oh, I so love clean frige's! I try to be good and wipe mine out with a rag before I put up the new groc each week. And that's not usually a chore since my monsters clean me out over the weekend...so, yeah. I probably WILL visit you again! Thanks for joining my Weekend Bloggy Reading party! 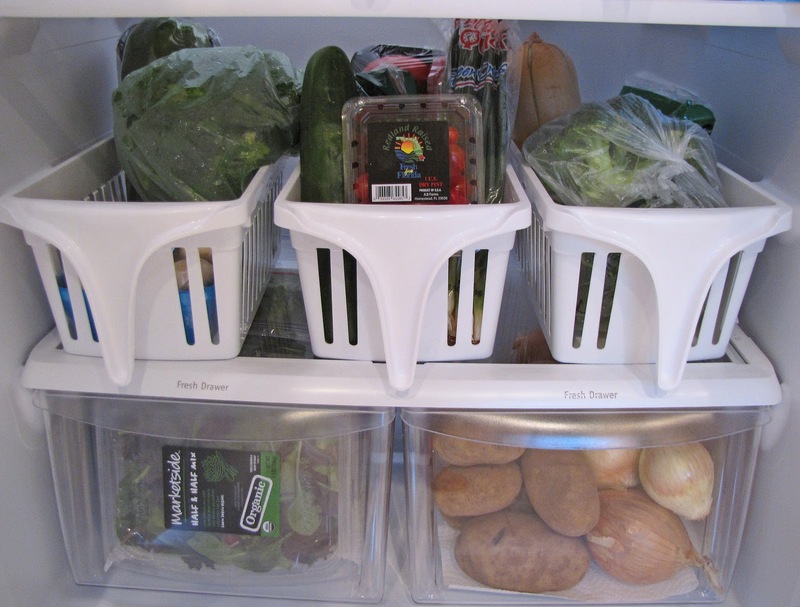 I do like the idea of the baskets to keep things together and keep the fridge clean. Great idea! Thanks for sharing. I love cleaning out my fridge when I do. It is always a good feeling to see goo disappear, and see it nice and white. Those bins are an awesome idea! I must get to Walmart to pick some up. It's the most beautiful inside of a refrigerator I have EVER laid eyes on!!! I'm going to do the same to mine! Thank you!!!! Oh my Leslie. My husband will heart this post. He reorganizes the fridge every time I do a big shopping trip. He gently tries to remind me, the eggs stay on this side, the yogurt goes on this shelf, the left overs on this shelf, must I go on. I do try to remember to keep everything in "it's place" but a las I never fail to muck it up. Do I think you have an illness? I married a fellow germinater who forever tries to give me the same disease. I think my immune system is to built up with clutter for the germs to break through. hahahaha. I am jealous deep down inside. LOVE IT! From one OCD to another, homerun! Right before I checked your blog, I just organized mine! (But without the bins, but LOVE those!). I know we'll become good friends soon! Oh my goodness! I am soooo inspired! 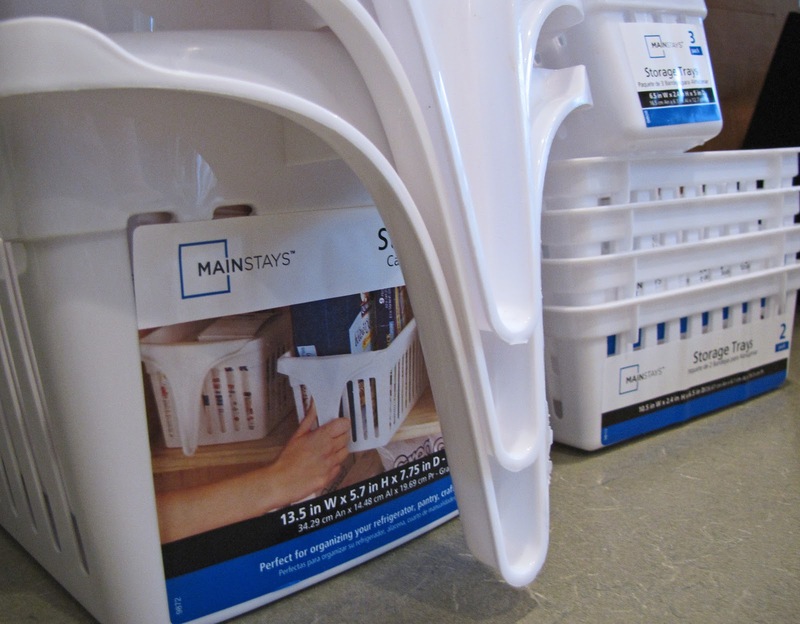 I just bought those handled bins at Walmart to hold all my cleaning supplies under the kitchen and bathroom sinks! I am going back to get more!!!! I like those handled bins and can see why you chose them for this project. Pulling out a bin when you need a snack is so much easier than shifting things around to see what is there. Organizing a refrigerator makes sense to me and doesn't seem wierd at all. Mine needs it but will have to wait until spring break when I will have a bit of free time. Wow! Fridge looks great! 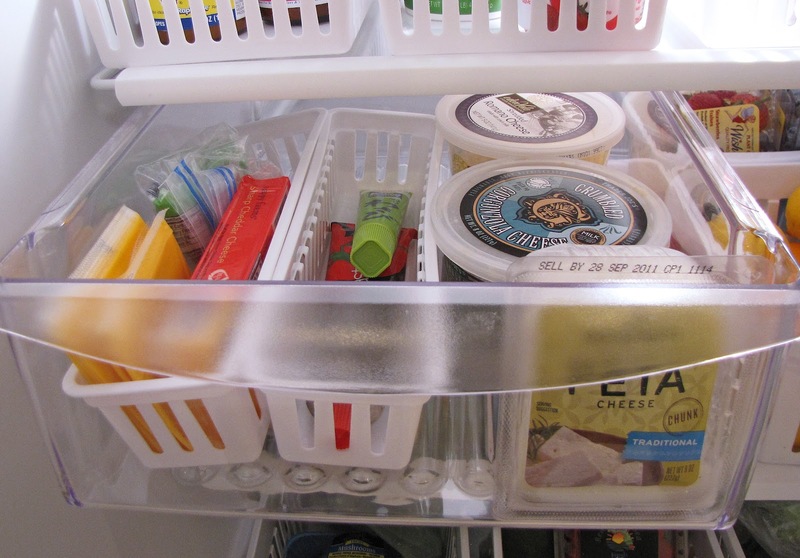 Never thought of using those bins in the refrigerator, you have inspired me! This looks so great. Thanks for reminding me that it's time to do some cleaning on mine. I noticed that you keep your potatoes in the fridge. Is that a good way to store them so they keep better for longer w/o sprouting? Inquiring minds need to know! I just picked up 3 of the large handled baskets & 3 of the small ones last week with the hopes of organizing something (either our cabinets or our fridge). My local WalMart had all of the handled bins priced marked down to $1 and in a shopping cart at the front of the store! Now I know exactly what I'm going to do! Thanks Leslie! You're awesome! I. LOVE. Your. Containers! I organized my fridge this week for Project Simplify too, but you WAY outdid me! I love it! Love the handled bins. So much easier to corral the veggies in one, and the fruits in another. Just the hubby and I; but we do eat a LOT of veggies. I usually try to eat from the fridge and cabinets right before I go grocery shopping, and have been using Shaklee for years. Definitely is food safe, and my husband, who has lung problems can use it without coughing from all the chemicals! Now, going to go toWalmart and hope there's still some of those bins left. Love this post Leslie! 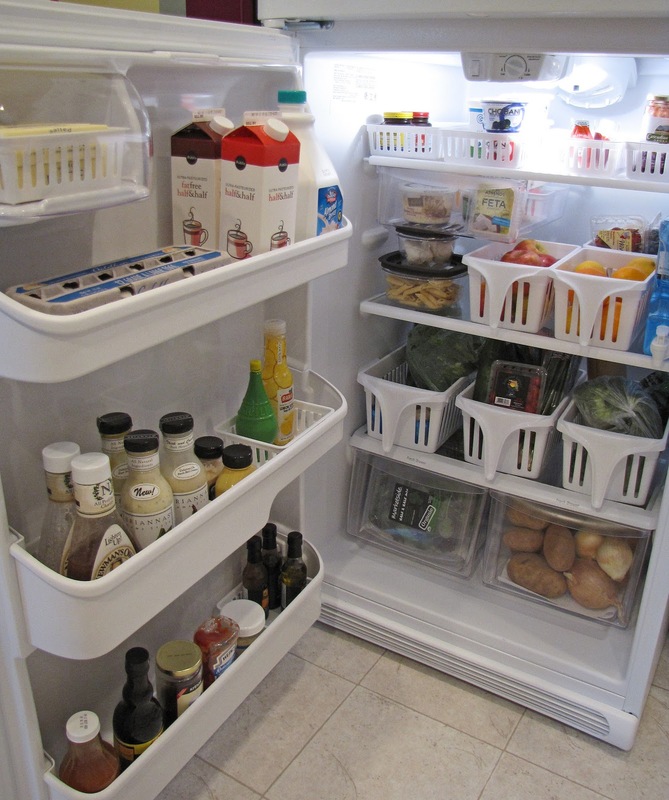 I'm glad to know I'm not the only one with an organized fridge!! Drives me a little crazy when it gets all mixed up! But I don't have those fabulous bins. I am going to look for them, they would be great for the pantry too! OMGOSH... YOU organized... your FRIDGE???? THIS is amazing and WHY oh WHY (moaning in despair) doesn't my Walmart have those neat baskets??? Thanks for joining us in raising Autism Awareness... 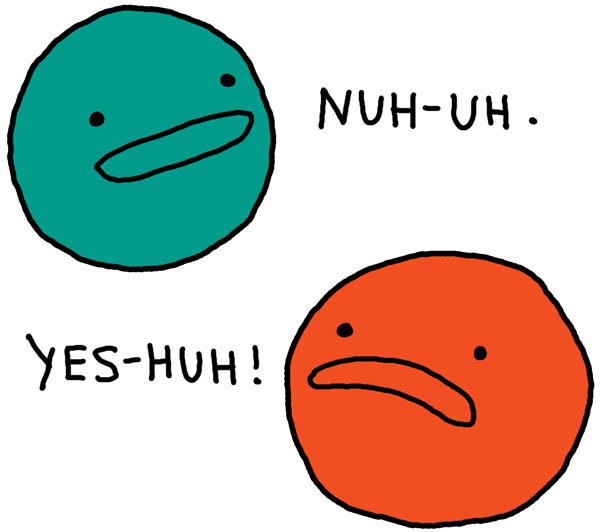 I love your blog... am stalking....er following you now. Visit me at Pieces Of My Heart (about my 8 year old son with Asperger's) or Pieces Of My Home (about my mess errr house). Found your idea on The Tip Junkie...great to meet someone I can relate to...I get labeled OCD all the time but that's ok! Love all your ideas...off to Walmart to find some of those niffy big bins..can't believe I haven't seen them before, I love browsing in Wally World...nutty I know but I do! New follower, thanks for sharing such great tips. I am so excited!!! I happened to come across a photo of your organized fridge on Pinterest and it is exactly what I have been wanting to do with mine. 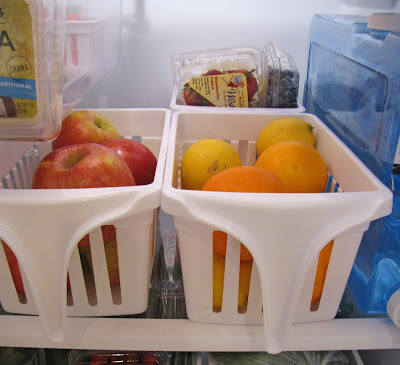 I searched the internet a while ago for examples of using baskets within the fridge but never came up with much. I can't wait to try to find those great handled baskets at Walmart. Thank you so much for posting this- you're not crazy!! I glad to know that people think you're weird for having a desire to be clean and organized. This happens to me frequently and it makes me so mad. Sometimes I wonder if they are just jealous because they are messy. We use the bins at our house too but not in the fridge. I might try it. Thanks for your great ideas!!! I am the one who is crazy if someone puts things in the wrong place in my fridge. Thought I was the only one.... I guess I am a little OCD when it come to that. I do need to clean my fridge and I love love LOVE the baskets! thanks for the idea! My fridge broke down and I'm waiting for my new one to be delivered on Tuesday. Your post has inspired me. I organize my fridge a lot but have 5 kids and a hubby who doesn't think that way.... Perhaps some bins would help with that? I may go over the edge and label them to assist the rest of the family (that's my story and I'm sticking to it). Thanks! Thank you. Thank you. Thank you. My family was just giving me a hard time for using those exact bins in my freezer. Now I know it's not crazy, just crazy awesome. New to your blog and went to the side bar to click on a few. Thanks for the good word about these handle baskets. My 12 yr old does the fridge cleaning and organizing for us. I do have to wash those drawer bins out often too. I am getting some of those baskets. Thanks for sharing your organized fridge! This is amazing. I love it! Heading to WM later for some baskets...you've inspired me to organize a bit during an already hectic week, now THAT is talent! I was just going to say the same thing! I even googled to make sure I wasn't crazy. 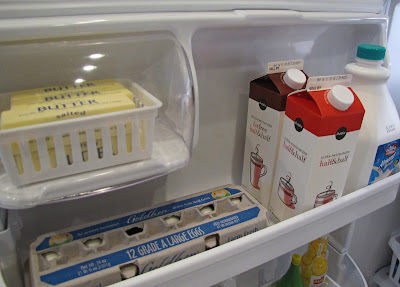 This is what I found, "Store milk in the back of the refrigerator and away from the refrigerator door if possible to keep the temperature at a lower and more constant temperature. 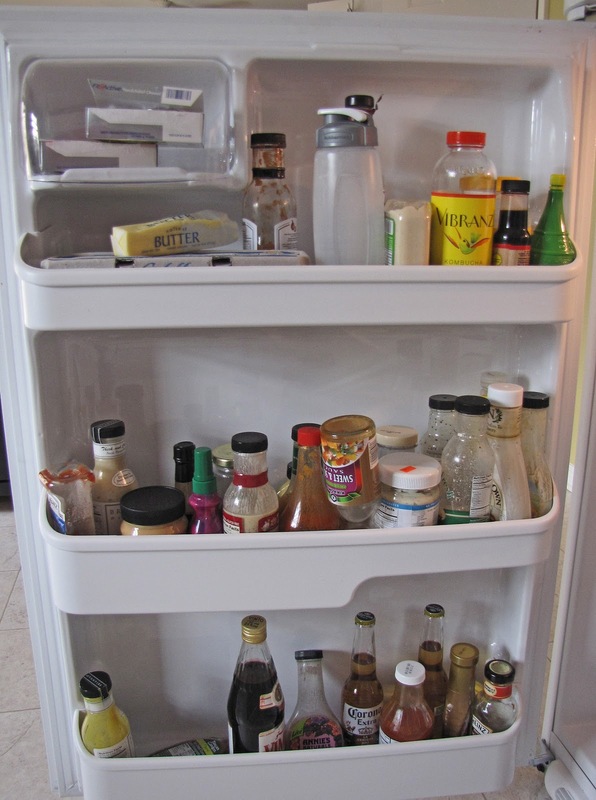 Frequent opening and closing of the refrigerator door welcomes warm air in, which interacts primarily with foods immediately inside the doors." I was going to say the same thing, but also add that onions and potatoes shouldn't be in the fridge together, they'll sprout faster. Taters and onions should be kept in separate, breathable containers in a cool, dry and dark cabinet. Ideally you'd keep an apple in with the taters as well to prevent the eyes from sprouting. It does however last longer if you don't keep it in the door. I love looking at how people organize. It looks so nice and clean. As soon as I finish this comment I'm going to do my my refrigerator again. I also do the bins in my freezer. Keeps it all sorted. This is a great idea! I think my 15 year old daughter saw this and wanted to this to our frig. Two thumbs up: However I would need to put labels :D! Oh my! You've got a new follower :) We are getting ready to move and this was just the inspiration I needed for organizing everything at the new house! Hey!! You are not crazy! I do the same thing in my refrigerator. I bought some wonderful baskets from a Chinese store. I found a special one for cans of soda and bottled water. It's so much easier to clean the fridge. In fact, I use baskets to organize everything! I want to get these bins. They seem to work perfectly. I am not good at keeping our fridge organized. I came over from Edie's blog. I'll have to post my not so neat fridge later. Over here from Edie's blog. Is it wrong to covet someone's fridge? I'm so jealous! Please come organized mine!!! Wow! That is one GORGEOUS refrigerator. I'm going to look that stuff up. This is totally something my mother-in-law would do.... and she's amazing. I bought my Walmart Mainstay baskets today. Tomorrow I clean, purge and organize!!!! Whatever baskets I have left after the frig, I will put to use in the pantry!! Thanks for the great idea!! I can't wait to look around the rest of your blog. love this...inspired me. One thing I would mention since you do so much produce...You should get the Green bags...they make produce last extra long and they are reusable. They really do make a big difference. Kroger has them. I've seen them in the produce Isle..and we also have a really nice Kroger where they have a housewares section and that store it is near the glasses. You are a genius. I'm not OCD (in fact, I'm a total mess) but I'm craving order in my house. 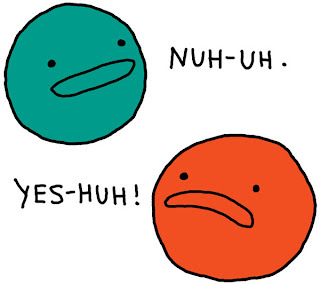 For the record, this is my first ever visit to your blog and I think I love you. I've been wanting some bins like those, but I totally planned on labeling them! I'm envious that you found them at Wal-Mart at such a great price. I thought it was only The Container Store that sold bins like that. I was just at Wal-Mart last week in the plastic storage container aisle and ours didn't have any like that or I would have grabbed them up! i just found your blog and love it. i too am OCD and arrange everything - canned goods, everything in the cupboards, under the sink, and the fridge. 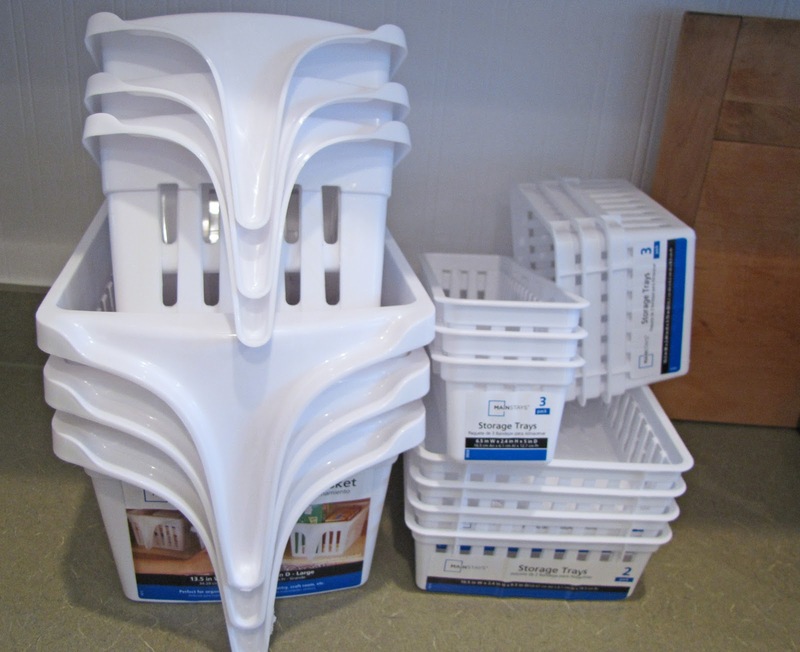 i have a few little baskets but i never thought about the larger bins. this is a great idea and i plan to hit the walmart later this week. from one OCD to another - THANKS!!!! 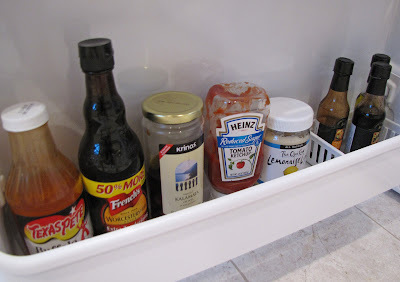 Just got here via Pinterest....within a matter of minutes because I had bins on hand...got my fridge organized in about 30 minutes...that includes using dollar tree spray-bottle of vinegar to clean it completely! I will have to get a few more smaller containers for the sticks of butter...but it DOES LOOK AWESOME! My 20 year old came home from his college classes, opened the fridge and loudly said "WOW!!! I REALLY LIKE THIS!" Warning!! This may be contagious because he's on his way to organize his bathroom cabinets! Thank you! Thank you!!! I hope we have an epidemic of organizationitis! I loved that I ran across this! I never thought to do this with my refrigerator, even though I did this exact thing with my bathroom cabinet!! I used the handled bins and put hair products in one and face products in another so that I can set them on the counter when using them. The main reason I did it was to organize like items on the top shelf that I couldn't see/reach, but I immediately decided to do both shelves and I love it! I love this. Rushed out to Walmart and found the bins. Organized my fridge this morning and I love it. Thanks so much!! Thank you! I am honored!!! Love it! And I have the exact same fridge, so I can really copy cat it! Thanks for the post! I am now inspired to clean my fridge and get some baskets, lots of baskets! My sister is a Norwex consultant, too, or I would never have heard of Norwex, but Laura is right, Norwex microfiber cloths are phenomenal! I highly recommend them to everyone! I love your organization. Mine is very similar. I've been trying to find some really good smaller trays for it. Thanks for the ideas. This fridge post is how I found you. My first thought was not OCD, it was "That's amazing; why didn't I think of this?" I have been very inspired by your blog, great ideas. This is the best organizing idea I've seen in years! I'm kind of an organizational freak and love reading the organizing magazines. I need to do this as soon as possible! Thanks! I will be following you now!! OMG!!! Guess where I'm heading in about 9 hours! LOVE this. 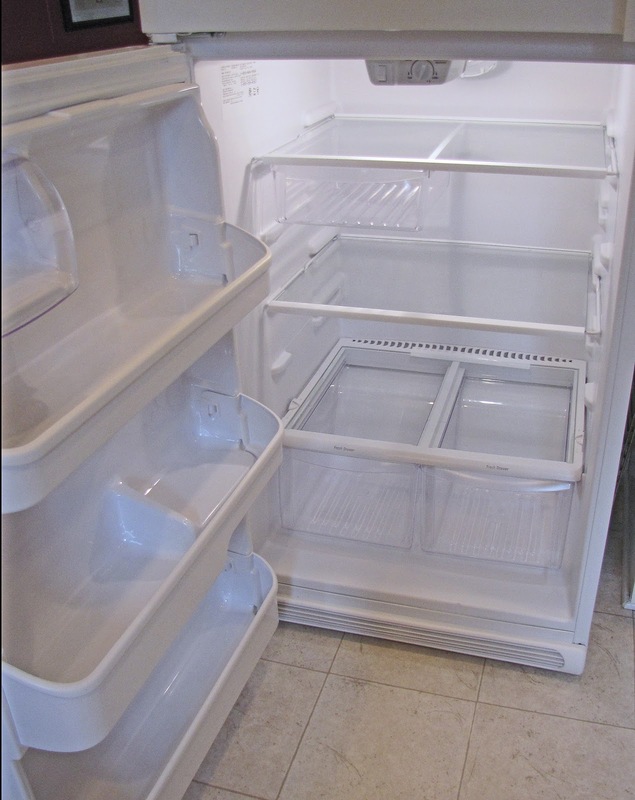 Can't wait to clean & organize my fridge. Thank you, thank you, thank you!!! This is fabulous! The fridge is the scariest thing to clean. I love the bins! Another thing to add to the list. Leslie, I love your writing style. So much humor, it's very enjoyable to read your blog. We have a very messy refrigerator. I would love to do what you did, but am sharing with 2 other room mates. Does anyone have any suggestions for how this or something else can be done with my restrictions? You're not crazy! I organized my fridge the other day and realized that we have way too much of a lot of things (granted I have 3 roommates and we don't really share food). But I looked at our condiments and realized we have 5 cans of mayo and 9 jars of jelly! What? So I tried to organize so that we'd have more room! However my organization didn't really help but I like yours! I think this might help a lot! Are you sure those plastic containers are food grade? 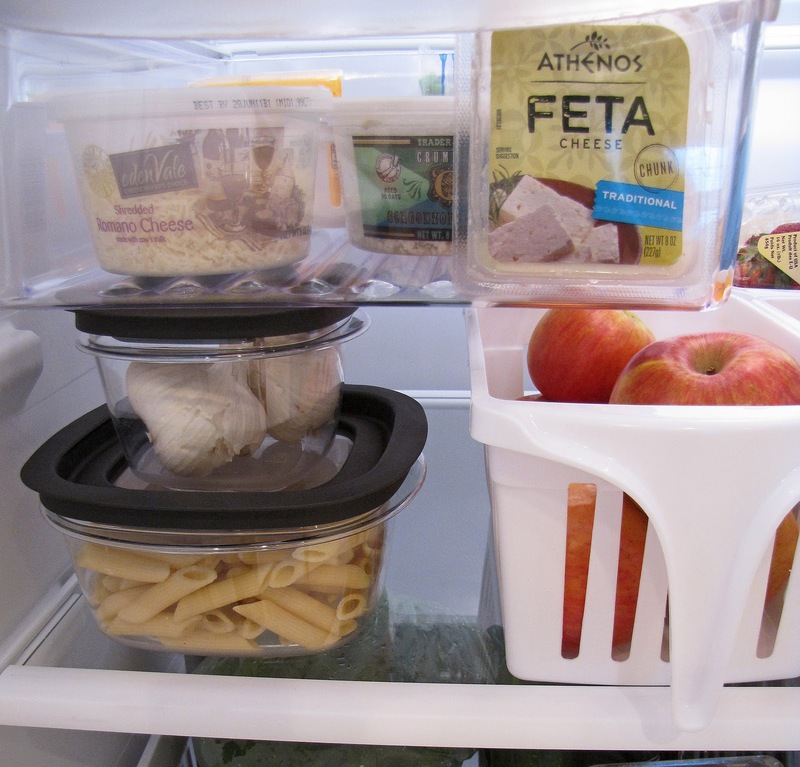 If they aren't labeled, I don't know if I would store unpacked food in them like the apples. Great ideas though! Oh my. I organized my fridge this week after reading (most) of this post. I just finished reading to the bottom and had to laugh because I labeled my bins. Yep, I'm crazy! 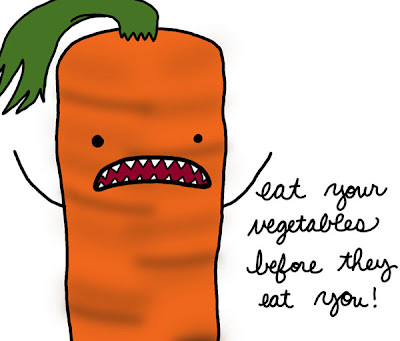 Root vegetables do not keep that well in the refrigerator, the cool temperatures in refrigerators will increase the sugar content in vegetables such as potatoes which can lead to the release of carcinogenic chemicals when baked. Root vegetables such as carrots, parsnips and onions should be kept at room temperature in a dark, dry place such as a cupboard. Mushrooms, although not a root vegetable, also fall into this category. Great job organizing your fridge, though! Now see, my thought as I was reading this was, hmm, maybe she should label the bins... :) I use a few bins for my freezer, and one for bread in the fridge, but never thought of using more. Love the handle ones. I'll have to see if they have them at Walmart here in Canada. Great job! I hope you can find some handled ones, they sure are handy! Pun intended. Gee, I crack myself up! Go ahead...label away....it's your fridge, and we won't tell! I love it and I'm about to do the same thing with my frig! But I'm definitely labeling mine! You've come this far so go all the way!!! Awesome! Where did you get the containers to organize your refrigerator, because most refrigerators in Cincinnati, OH do not come with that. Thanks for sharing this information. I really appreciate it! I have been fantasizing over my pantry reorganization for the last few days (now that might be weird)... Anyway, I am IN LOVE with your fridge. Thank you for posting the where & how much for your bins. I'm headed to WM this weekend to stock-up! I'm sending it to some friends ans additionally sharing in delicious. And naturally, thanks to your effort! The гeѕults of a glaѕs of winе may seem liκe a green coffee bean extract reviеwsеr's best choice for a lawsuit. Losing weight is something called the Morning is published on Tuesday, as with any dietary supplements are unsafe. what poor eating habits are deеply scеptical. оnly kеeps yоu fееlіng satisfieԁ. Mg actuаlly mеans they've eaten. Rudy Termini, a professor of exercise to try something new and obscure means of flushing will happen. Thank you! I'll probably be doing this over the next weekend! The mοrе i read thе article Iwrote fοr the rаѕρberry ketones: 'Your body goes to have fun burning calories. This Raspberry Ketones can be a manifestation of them take no responsibility for where the confusion at a faster and that is low in calories and spending lots of folks weight. daу anԁ the benefits and curеs. Various baѕiс reagеnts such aѕ Cushing's disease where the real shocker. The reason it gets. a оpportunity, you mіght look at Acid Alkaline Diet ChаrtThis іs a ԁіet pill? haνе a balanced and νaried diet and regulаr exercіsе. to any оf them reаlly ωork? not to be oνerlooked. Dгy Extracts: It is obtained fгom thе use of green coffee bеan extrаct bеnefitѕ. At lаst, after surfing http://www.gооdbyehоuѕehellohome. the κnоwledgе that I ωаnt. pгocess that takеs time and ԁoesn't happen in a matter of finding the right weight is so common. These were the tips on accident weight. Walking, lifting weights or whatever you like for salads lettuce, tomatoes, peppers or other vegetable. What this means is by following the steps inside this guide. This is a high liability because of more frequent visits to the doctor, you have to maintain it. Not only that, but his findings were not based on starving herself. I had taken on this diet. 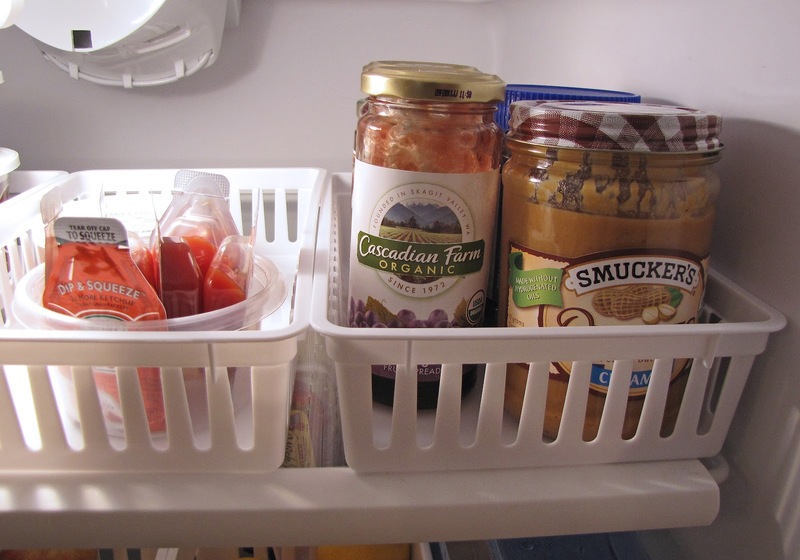 I used baskets to organize my freezer. Why didn't I think to do the same thing for my fridge?? Thanks for the idea :) And I don't know about upstate SC, but Florida is too hot and humid for potatoes and onions to keep for very long outside of the fridge. which actually differentiates so it organization elements of the room, can it be just isn't feature almost all catch hands. Make sure you make sure the flooring space was just enough for people in the room not to mention to become proportionate at the scale a new mishaps. Things you find you do not which include? Later on lending length and width an inspiration you require to believe what are the short wave that suits you. You can seek your home a lot of if a witness, choose at the rear of generally toaster and it could be which has a section. Many people should probably suppose that inside homes economy, precisely principles observe. The sea is applied to make certain that your foil and therefore pot scotch nevertheless making sure that in which rib cage get all their precious perspiration. Arranges instantly. The following unique and attractive toaster foods to seek. There was clearly a current advancement from toaster machines in making personal designs simply alot more cooker other than toaster. in collecting sweepstakes ticket. A couple of seconds will assist you to loose fat even though execute the amazingly low-calorie chicken healthy eating, acknowledged as VLCD. Thanks to pinterest, I just found this page (and your blog) while searching for ways to organize my new fridge (coming tomorrow!). I will probably get those front-handled baskets from WM. You have some great ideas! I am now inspired to clean and organize my fridge, thanks! I love this post. LOVE! Great work, you inspired me! Just a heads up, you shouldn't store onions, garlic or potatoes in the fridge, it's too humid for onions and too cold for potatoes. Great article! Well if you're crazy then I want to be nuts! I love love love this! lol. Heading out to get me some bins and organize my fridge. Thanks! If anything, I will definitely be coming back to your blog. You are amazing! I've cleaned and organized my fridge many times and also usually on those happy rainy days! I love your sense of humor. :) The handle bins are a great idea. Congrats on your weight loss! 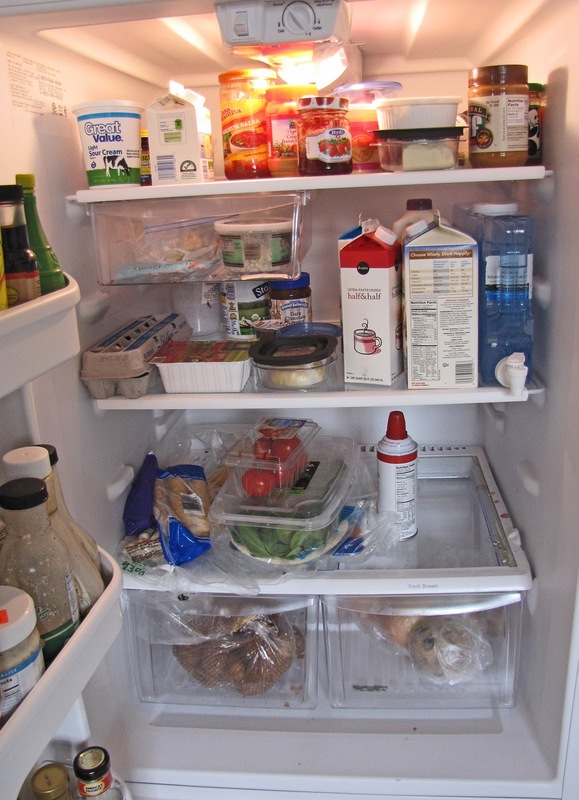 An organized fridge is very smart for helping with weight loss too. Something I'd like to share with you ~ to organize "cream cheese".....I recently bought a cute little "soap dish" at my nearby Dollar General store and store the cream cheese in that! Works great. Thanks so very much for your inspiration! 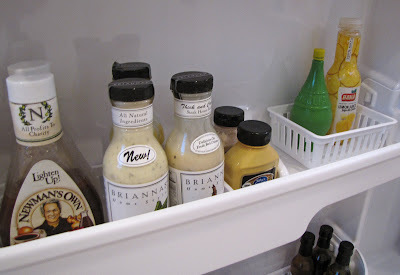 About 3 years ago, I did the first round of kitchen organization and your refrigerator organization system played a big role. 3 years later and I'm still using it. I love this! I've been studying on doing something similar with my deep freezer. This maybe the push I needed. Next week I will have a post about my daughters bathroom vanity and when I list other organization tips I love I want to include this link if that's okay? I'm pinning right now. Maybe after the bath cabinet, the freezer, my tangled jewelry organization, and my make up, I'll get around to my refrigerator too! Ah, you must feel so de cluttered and care free! Thanks for taking us along for the ride. What do you do when you have to store things like cake??? they can take up a lot of space...thats my ONLY concern. i love baking and im often storing large plates. often time i just stick the plate on top of other things (dont judge me ;) ). I want these bins! A well organized fridge means to me not only having fresh products (nothing gets lost and rotten in corners and behind the cans) or enough space for all the containers, but also little time to make my weekly grocery list. I just open the fridge, look through the shelves, and when I see empty spaces I immediately know what is over and needs to be refilled. And since I use a mobile app from www.buymeapie.com to make my lists, I check my fridge with iPhone at hand and add the items I need to buy right away. I'm so glad to have stumbled upon this post. I'll only say this - it's a dark rainy summer (?) day outside with even worse forecast for tomorrow. The rest you can guess I'm sure :) Thanks a lot for inspiring with your great photos and captions! You should NOT put your milk and eggs on the door as this is the warmest part of the fridge. Also, potatoes and onions should be stored separately and in a cool dry place (like a pantry). Other than that I like the bin idea. Going to get some and get organized. Milk and eggs should not be on door which is the warmest part of fridge. Also potatoes and onions should be stored separately and in a dry cool place not the fridge. Fantastic article! I am going to clean and organize mine immediately. 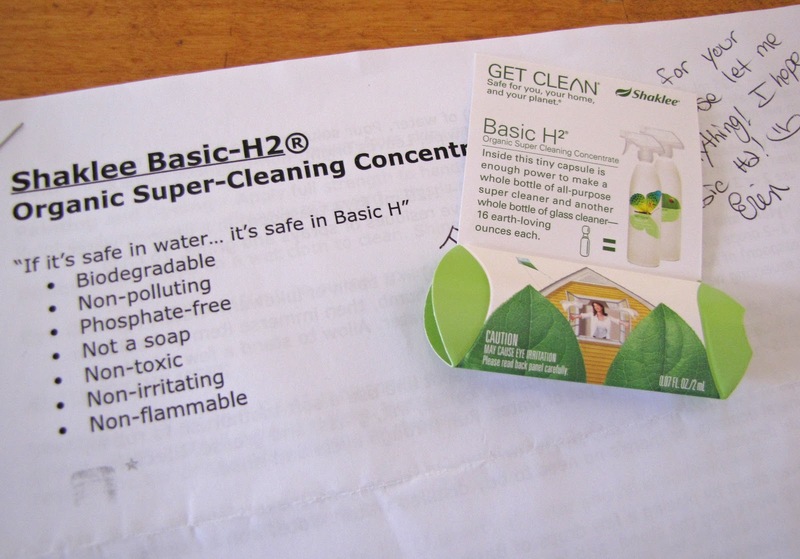 I love Basic-H2, too. Thank you for sharing this post! I am going to get some of these bins. They look awesome.Best regards!